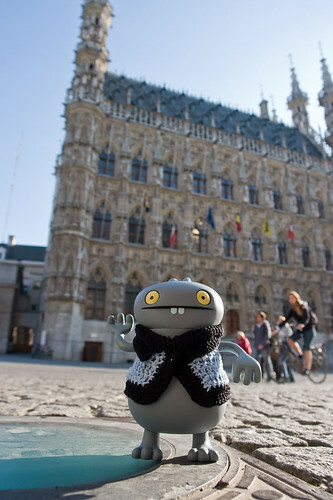 Uglyworld #470 - Babo Checks Out Leuven Town Hall, originally uploaded by www.bazpics.com. Tonight the pair of them were showing off their images, in this case you have a shot of Babo in front of Leuven Town Hall which in Babo's own words, "It's like one of the bestest buildings in the whole wides worlds, is awesomes, really, you hears me, awesomes!!!". How could I even try to say anything against that, Babo's words are completely true though - the detail on the Town Hall is simply breathtaking - definitely worth a visit if you ever find yourself in Leuven.